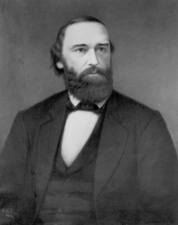 FOGG, George Gilman, a Senator from New Hampshire; born in Meredith Center, Belknap County, N.H., May 26, 1813; pursued classical studies and graduated from Dartmouth College, Hanover, N.H., in 1839; studied law at Meredith and at the Harvard Law School; admitted to the bar in 1842 and commenced practice at Gilmanton Iron Works, N.H.; moved to Concord in 1846; member, State house of representatives 1846; secretary of State of New Hampshire 1846; newspaper publisher 1847-1861; reporter of the State supreme court 1856-1860; secretary of the Republican National Executive Committee in 1860; appointed by President Abraham Lincoln as Minister Resident to Switzerland 1861-1865; appointed as a Republican to the United States Senate to fill the vacancy caused by the resignation of Daniel Clark and served from August 31, 1866, to March 3, 1867; was not a candidate for election to the Senate in 1866; editor of the Concord Daily Monitor; died in Concord, N.H., October 5, 1881; interment in Blossom Hill Cemetery. Dictionary of American Biography; Woodbury, Augustus. A Memorial of George Gilman Fogg. Concord, NH: Republican Press Association, 1882.